Sometimes these flybuys offers are pretty excellent. 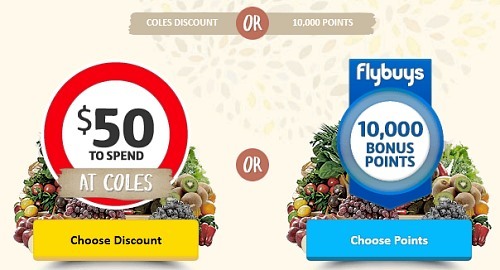 A few weeks ago they sent me an email offering me either $50 credit at Coles, or 10,000 flybuys points which also = $50 credit in return for spending $70 a week for 4 weeks. I prefer to use my flybuys credit in small chunks so I went for the points. You can redeem 2000 points for $10 off a shop and I like to save my points for weeks when the budget needs a little helping hand. On a recent Saturday afternoon, I realised we had not spent our $70 for that week, so out into the rain we went, for an impromptu and somewhat rushed shopping trip. We only needed $36 worth of stuff, so a few items we would not normally buy ended up in the shopping basket. 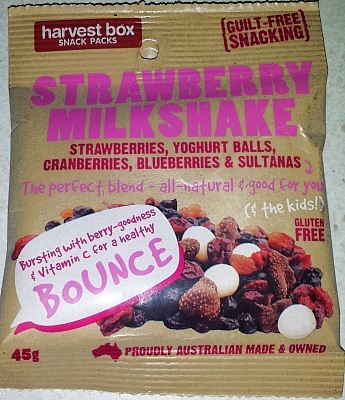 I’d heard of Harvest Box before and I’d wanted to try their healthy snacks subscription box when I was working in the call centre but never got around to signing up, so when I saw these new packaged Harvest Box snack packs at Coles on special for $2 each, I thought I’d give them a try. It was a total impulse buy. I am a sucker for cherries, so I grabbed these without a second thought and without reading the packaging. I ate one of each item before I took the photo, which means there were 2 cherries. 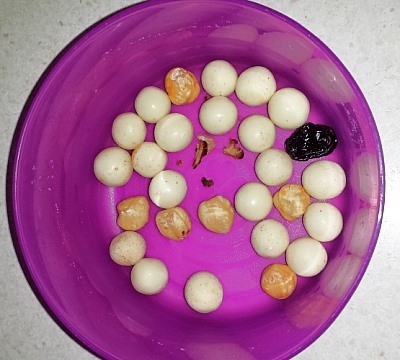 7 hazelnuts and 20 yoghurt balls. This is not especially balanced in my opinion, and me personally when a product has Cherry in the title, I’d like to see a few more cherries in the mix. With that said, the yoghurt balls are very tasty and more-ish. Strawberry Milkshake was a little better, with 4 strawberries and a mix of other berries. I didn’t count the other bits but it seemed like a much more reasonable mix with just 12 yoghurt balls. The biggest concern I have with these is the little thing on the back of the packet that says “Made in Australia from local and imported ingredients” and nowhere could I find out more about the origin of the items I was eating. I searched the website and their Facebook page to no avail. A lot of people may have forgotten the frozen berries and Hepatitis thing, but I have not. I would not buy these again – as tasty as they were – purely because of that tiny little writing on the back of the pack. In fact, these were bought on a very rushed shopping trip and had I checked the label in the store, they would not have gone home with me at all. I usually check the label of any new product I buy. That discovery was very disappointing. :( I’m sure if I spend some time in the dried fruits aisle, I can find better options grown here which are more reasonably priced and if I can’t find what I am looking for, I would prefer to eat something fresh but grown in Australia. I hope companies realise when they are not specific about what items are imported they might be losing sales. 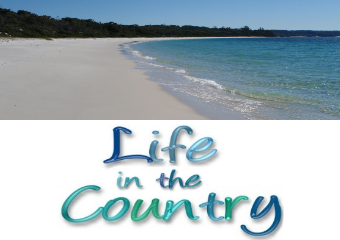 For example, my favourite salad dressing now has Made in Australia from local and imported ingredients on the label. I contacted them for more information – not wanting to have to find a replacement salad dressing – and was informed that the only imported ingredients were the extra virgin olive oil, which came from Spain, and the balsamic vinegar, which came from Italy. It would not have been very difficult to make that clear on the label. As always, nobody paid me for my review of these items, I bought them myself with my own money, I am reporting to you my personal experience, and this is totally my own opinion which others might not agree with. ← How To – Add A WordPress.com Follow Button To Self Hosted WordPress. While manufacturers may be against clearer labelling, they may do themselves some good, such as the locally made yoghurt I am buying at the moment, still with local and imported ingredients. What is imported? Maybe it something to make yoghurt set. I am sure it is not the milk part of the yoghurt. Maybe it is the fruit mixed in it. I like yogurt balls, but not cherries, so I would do well with that package. ;) I’m a sucker for trail mix which is very unhealthy, so I stick to unsalted whole almonds for my snack. The bag is a lie! 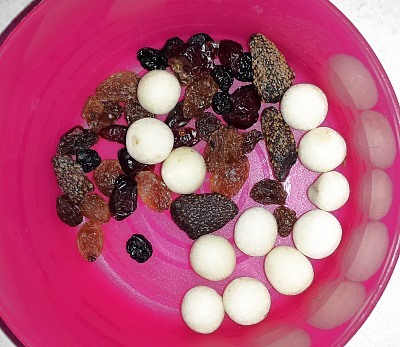 Clearly these products should be marketed as “Yoghurt balls with assorted nuts and dried fruits.” I think the true test would be to get multiple packets of the cherry variety and compare the quantities in each bag…. 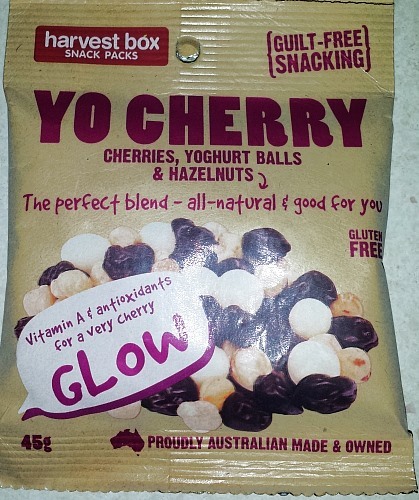 Yeah it should be Yo Yoghurt Balls.. :) The two cherries were fantastic though. If this had more cherries I would be into that! Yeah I’ve not forgotten the hepatitis berries, so I am now reading packets carefully for imported ingredients. I see a lot of people doing this, way more people than I used to see doing this.. and I am assuming that they are doing this with new things they are buying and not things they’ve been buying since it happened and they checked all their labels then, so this makes me think that in general people are checking the labels more than ever before. It’s so annoying when I buy a snack mix or trail mix, which contains peanuts, fruit, etc. and it’s 95% peanuts. I mean, I like peanuts, but the reason I bought a mix is h3 cause I want a reasonable mix of ingredients. I agree, it’s frustrating when you buy something and can’t find any information as to how it’s made or where the ingredients come from. Who knows what we’re eating? See now, this is why I don’t have a flybuys card. I simply don’t see the point of shopping more to amass points that get used for small things like a cup of coffee etc. Much cheaper in the first place to just pay full price for the cup of coffee. Where you had to rush out and buy $36 worth of stuff, I would have put that $36 back into the kitty or into savings. Also, one side benefit of flybuys is that every week I get an email which tells me what items I regularly buy are on special this week, and a lot of times those things aren’t in the catalogue. For a lot of people, with the berries recall, flybuys was the only way they could prove they had bought the berries as they didn’t have the receipts. Yes, definitely. I read labels much more carefully now and so many things just go back on the shelf instead of into my basket. NZ is a loophole a lot of manufacturers are using apparently, their rules are less strict than ours.